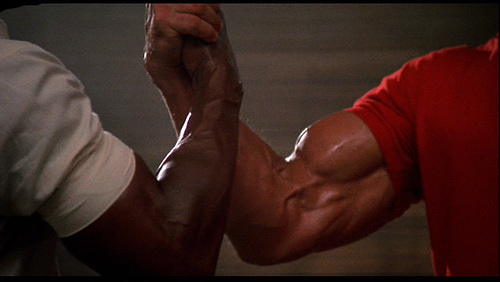 This scene was actually a 2-for-1, with Rocky legend Carl Weathers (Apollo Creed) on the other end of that monster grip. Arnold has said that he always filmed his muscle scenes first on any project because maintaining his conditioning on set was so difficult. I imagine they shot this scene on day one. The movie Twins was full of gratuitous disrobing by Arnold. But 20+ inch arms remain an impressive thing regardless of the marketing. I remember thinking at age 15 that it was pretty cool to be able to tear apart the sleeve of your shirt by flexing your bicep – and I still do today. This entry was posted on Saturday, May 28th, 2011 at 2:00 pm and is filed under Motivation. You can follow any responses to this entry through the RSS 2.0 feed. Both comments and pings are currently closed.